March 25, 2012 by Alphageek in "alphageek", "cooking", "discovery"
Today, I will tell you one step to making a great cup of coffee. More exactly, this short and to the point article deals specifically with storing the coffee after it is prepared. Making good coffee can be one of the most complex, and individualized out there in the expanding world of food. The opposite side of the coin is the number of cups of really bad coffee that are purchased, given away, or stolen by someone at work who drinks the last drop of crappy coffee and refuses to make more. Yes, coffee runs the spectrum of good to bad. Sometimes, the place that serves the best coffee one ever had also serves coffee that tastes like it was heated by a Bunsen burner all day, until nothing but carbon is left in the pot, and any organic organism surely must have been destroyed down to the sub-atomic level. Here at the headquarters, we use a drip coffee machine. No, we are not going to talk the whole process, please try to keep up. The single best thing we did to improve the coffee here was to buy one of those coffee makers that drips the coffee into a carafe. No leaving the coffee on a burning heater, if you want the second cup of coffee to be drinkable. 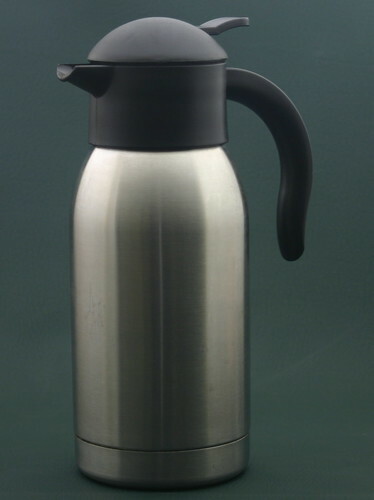 We were happy for many years, until the carafe coffee maker was recalled. Not wanting to burn the house down due to an electrical short, we reluctantly parted with the maker and purchased a similar model. The "similar model", to use a really technical term, sucked. When pouring, it leaked coffee everywhere after few months, and the coffee cooled off in about ten minutes. The leaking indicates the carafe is not sealing properly, and the lack of a seal allows the coffee to cool quickly. This system needed an upgrade. The credit for this upgrade goes to Mrs. alphageek. She found a great solution. We purchased the Oggi carafe that you see below. Simply put, this carafe keeps the coffee hot, without the application of more heat. Here is the algorithm to use this carafe. After coffee is prepared, pour any unused coffee IMMEDIATELY into the carafe. Do not leave it on the heater for the coffee maker, or on any other form of heat. Heat is the enemy of good coffee. I don't get any money based on where you buy something like this. We purchased ours at T.J. MAXX, but we have also seen them at Marshals as well. These stores carry cooking items at some great prices, so we always check these stores out.